Seems like we’ve been singing more songs about heaven lately since our friend Kevin’s passing. This is a recording from our worship team rehearsal of a song we sang at church a couple weeks ago. 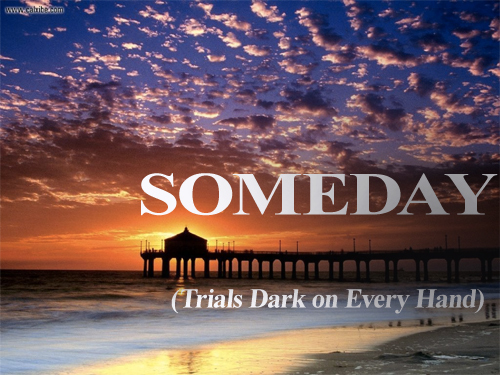 It’s a mashup of two songs actually, Someday and When the Morning Comes (otherwise known as “Trials Dark“). Someday we don’t know where came from (it’s been sung in our fellowship for a couple decades or so), and Trials Dark is an old time song written by Charles Tindley back in 1905. We start with doing Someday adding one part at a time, then go to the verses of Trials Dark with using Someday as the chorus. They work really well together with a message of where we are all headed. Lyrics and chords are below. And we’ll follow ‘till we die.